In a previous post I addressed some of the issues involved in using the studio mylars in Brother KMs. I have an enormous store of them from back in the day when it was only possible to have single patterns occupy a fixed number of rows, while the remaining surface for those rows was unusable. This fact changed when the company produced the EC1. I revisited this topic after a forum question on the subject. It would be convenient to produce consistent results with the Studio brand, and be able to use my stash of them as well. I had tested template markers on Brother mylars when ink pens were discontinued and I had no luck with permanent markers, found they shed a bit and pencils tips broke easily, while I could not be as neat in rendering small markings as simply by going the route of using a number 2 pencil on the mylar’s back ( I prefer the Mirado Warrior HB 2). 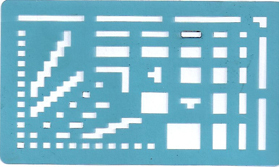 Drawing with enough density “within the lines” on mylars is rendered far easier with one of these templates, at one point made available from Brother. Similar ones may sometimes be found in stationary or art/ drafting supply stores. The images below shows my first “new” tests: on the left I drew with the template marker over previous pencil markings, the squares repeat over # 36 was made with multiple layers of sharpie (which smeared even after what would seem like adequate drying time), the ones over #42 are made with the template marker. The sharpie did not get scanned properly by the reader, all other marks did. There is a guiding pencil line placed where the set line familiar to Brother users would be. In the first narrow column to the right the pencil marking corresponds to first visible row (design row 1 in reader). The column on the far right (absent from Brother) could be used for additional cues in knitting ie. color changes, knit rows between lace transfers, etc. 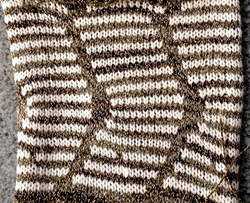 the “patterning errors ” in the image above (extra brown stitches third white stripe from the bottom of the swatch) were actually due to a bit of eraser left after its use on the the mylar in the blank area of the card. In summary: there have been good results in my trials in using the template marker both on top of already rendered electronic pencil drawings or on previously blank sections of Studio mylars and subsequently having them read by my Brother 910, with limited results in having small repeats read when drawn on the back of the mylar in pencil, but not with larger motifs. There have also been some problems that are not immediately explainable.